In its quarter that ended in December, Apple’s spending on R&D surged 14.5% year-over-year to $3.902 billion. R&D as a percent of revenue reached 5.63%, up from 2.1% in 2012. The continuous growth of Apple’s R&D, in conjunction with its stagnant or declining revenue base, will hurt its operating margin in the near future. Declining operating margin is another headwind for Apple stock. The company’s operating margin has declined for 12 out of the last 13 quarters. In the December quarter, its operating margin fell by 2.07 percentage points year-over-year. The increases in Apple’s R&D spending are definitely positive for the long-term outlook of Apple stock. But AAPL needs to come out with some solid products and services which can meaningfully raise its top and bottom lines. There has been a substantial increase in R&D spending since Tim Cook became CEO of Apple. The company’s R&D as a percentage of its revenue has increased from 2.1% to 5.63% during Cook’s tenure. 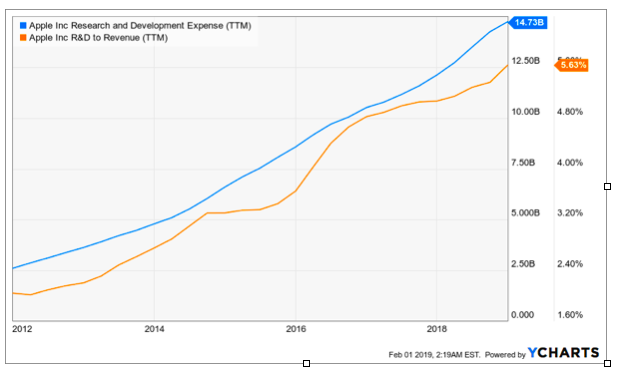 In the past few quarters, R&D expenses have been higher than the total dividends paid on Apple stock, even as AAPL has raised its dividend meaningfully. In 2018, the total dividends paid to the owners of Apple stock came to $13.94 billion, while R&D expenses totaled $14.7 billion. It can be argued that AAPL is investing in its long-term performance, instead of focusing solely on returning more money to the owners of Apple stock. Although I have an “underperform “rating on Apple stock, the fact that it’s investing more in R&D is certainly positive. However, the other side of the coin also needs to be analyzed. In the past few years, several competitors have closed the gap between their products and those of Apple. Apple’s competition from Chinese OEMs like Huawei, Oppo, and Xiaomi has been especially intense All these players have been able to launch smartphones with low bezel counts and many new features within a short time of the launch of Apple’s iPhone X. These companies are a big reason why AAPL is having a hard time growing its market share in China and other emerging markets. All these companies are also aggressively trying to improve their market share in Europe. Apple’s net sales in Europe declined from $21.05 billion in the quarter that ended in December 2017 to $20.36 in the quarter that ended in December 2018. Huawei’s market share increased from 11.8% in December 2017 to 16.9% in December 2018. Xiaomi’s market share has increased from 1.8% to 4.5% during the same period. These companies are increasing their market share in Europe even though the region’s smartphone market has already been saturated. Apple’s European market share, by contrast, dropped from 29.3% to 28.3% during this period. The European market share of Huawei and Xiaomi can rise rapidly as they launch their 5G devices this year while AAPL delays the launch of its 5G smartphones until 2020. Europe is a very important market for Apple. It accounts for 24% of the company’s total revenue. The recent decline in Apple’s revenue from Europe shows that AAPL faces headwinds in this region also, along with the difficulties with which it’s contending in China and other emerging markets. Of course, Apple’s struggles in those regions don’t bode well for Apple stock. The projected upper bound is: 182.86. The projected lower bound is: 157.12. The projected closing price is: 169.99. One method of interpreting the Stochastic Oscillator is looking for overbought areas (above 80) and oversold areas (below 20). The Stochastic Oscillator is 26.4379. This is not an overbought or oversold reading. The last signal was a sell 3 period(s) ago. The RSI shows overbought (above 70) and oversold (below 30) areas. The current value of the RSI is 59.17. This is not a topping or bottoming area. A buy or sell signal is generated when the RSI moves out of an overbought/oversold area. The last signal was a buy 27 period(s) ago. The CCI shows overbought (above 100) and oversold (below -100) areas. The current value of the CCI is 51. This is not a topping or bottoming area. The last signal was a sell 4 period(s) ago. APPLE INC closed down -0.710 at 170.180. Volume was 45% below average (neutral) and Bollinger Bands were 5% wider than normal. APPLE INC is currently 11.2% below its 200-period moving average and is in an upward trend. Volatility is low as compared to the average volatility over the last 10 periods. Our volume indicators reflect moderate flows of volume into AAPL.O (mildly bullish). Our trend forecasting oscillators are currently bullish on AAPL.O and have had this outlook for the last 13 periods.